For this week in our Alphabet Exploration, we had some greater success in identifying words that begin with D. In previous weeks all the letters were for Elmo and Ernie or Abbie. This week, G really enjoyed some of the Dd activities and I think that made the letter/concepts stick a little bit more. Monday: Dd is for duck. There was a whole lot of quacking going on around here on Monday. G made the connection between the letter d and duck pretty quickly on this day and we played a lot with her ducks throughout the day. We also had a duck bubble bath at night and went on a duck hunt (similar to our bear hunt from the previous week). G really enjoyed being a “hunter” again and was proud of her collection of ducks! Tuesday: We took the day off because we were gone most of the day. We still took every opportunity to review what we talked about on Monday regarding ducks and the letter D.
Wednesday: Dd is for drum. 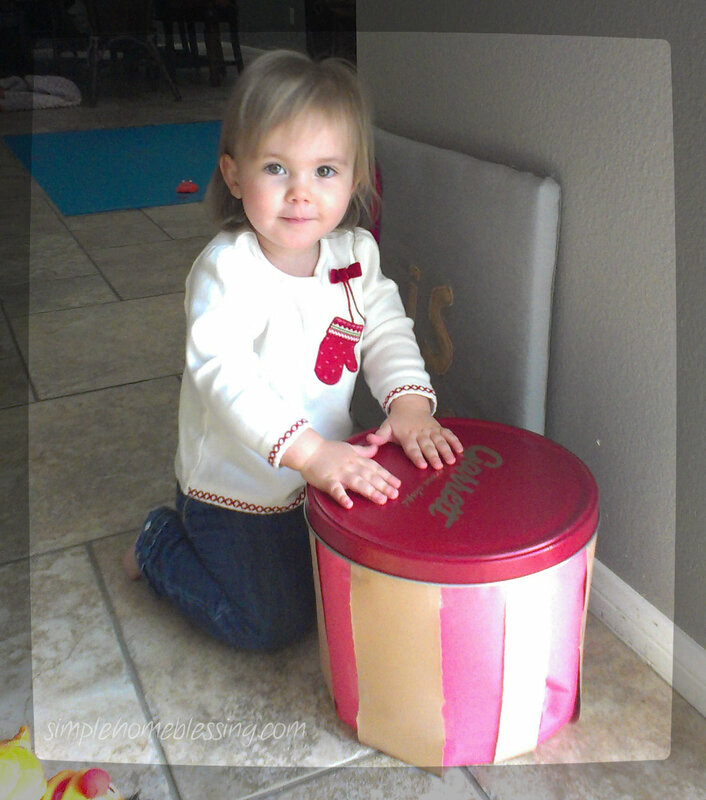 While G was sleeping, I threw together a craft-y drum, made from a popcorn tin, for her to play with when she woke up. She loved the drum and was able to recognize that it began with the letter d. We spent a LOT of time drumming throughout the week and this was a wonderful activity for her. Thursday: Dd is for dog. We have some seriously annoying dogs in our neighborhood (sorry, dog lovers, but I have wanted to call Caesar Milan for a while now), so G has a very good concept of what a dog is. So, today was a no-brainer. I told G, “D is for dog.” and she said, “I hear it,” referring to the dogs that bark like maniacs a few times a day. We reinforced D is for dog by reading books about dogs and making dog sounds. Friday: Dd is for Daddy! This is one she absolutely loved and got right off the bat. I almost didn’t need to show her anything to help her get this concept. I told her D was for Daddy and she said it for the rest of the day. I planned to take G on a special lunch with D but he was finishing up a major project at work that prevented him from being able to. I still have that on the schedule for later, but she did not have any trouble making the connection between D and daddy because she loves her Dada SO much! 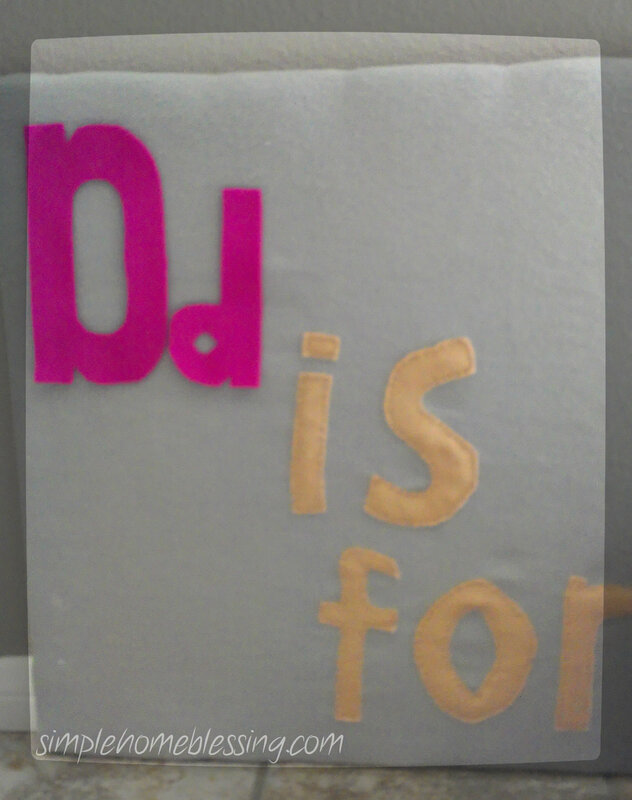 New Idea for Alphabet Instruction: This week, we did a placemat activity (similar to what we did with Cc is for colors) with G for the letter D. I laid out a couple of pieces of construction paper in front of G and taped them down, then drew a big D and a little d. Then we found a d stamp out of our stamp collection and she stamped for the first time! Oh, she loved it. It was a wonderful way for her to work with D while I made dinner.